The father of one of the suspected gunmen in the Garland, Texas, shooting told ABC News that his son "made a bad choice." "We are Americans and we believe in America," Dunston Simpson said Monday. "What my son did reflects very badly on my family." Simpson's son, Elton, was identified to ABC News by a senior FBI official as one of the suspects in Sunday's failed attack on a Texas community center that was hosting an event displaying cartoons of the Prophet Mohammad. Elton Simpson and another man were killed by a police officer after they opened fire on the officer and a security guard, local police said. 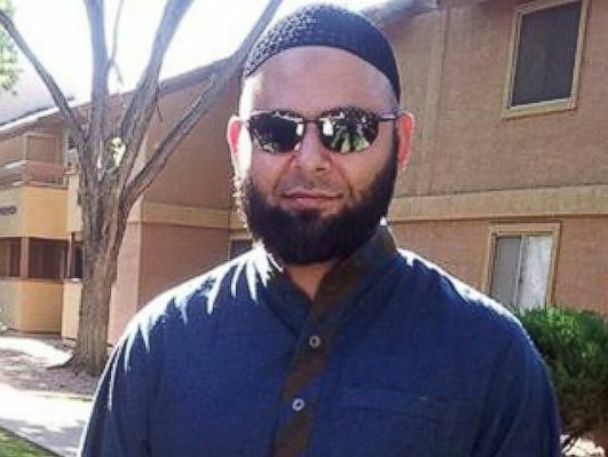 Nadir Soofi is seen in this image posted to Facebook, outside his Phoenix apartment complex. FBI agents and a bomb squad were at Simpson's home in an apartment complex in north Phoenix Monday conducting searches of the apartment. Officials believe Simpson is the person who sent out several Twitter messages prior to the attack on Sunday, in the last one using the hashtag #TexasAttack about half an hour before the shooting. Prior to that, the Twitter account holder had published messages sympathetic to Islamic terror groups such as ISIS. Dunston Simpson said his son worked at a dentist's office but was "on vacation" for the last few weeks and that the two last spoke three weeks ago. But they "had not much to talk about, because we had some very serious differences." Still, the elder Simpson said that while he was a strict father, Elton was "always a good kid." John Iannarelli, Assistant Special Agent in Charge FBI's Phoenix office, said authorities in Texas traced both suspects to the Phoenix apartment and that the two appear to have been roommates. The second suspect has been identified as Nadir Soofi, according to law enforcement officials. Followers of ISIS had been sending messages about the event in Texas for more than a week, calling for attacks. One referenced January's Charlie Hebdo massacre in France and said it was time for "brothers" in the United States to do their part. 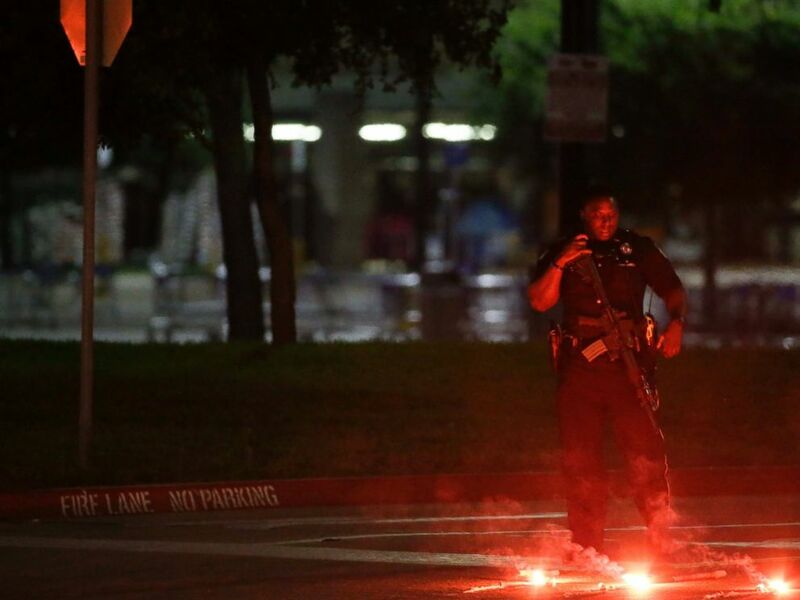 An armed police officer stands guard at a parking lot near the Curtis Culwell Center, May 3, 2015, in Garland, Texas. Simpson was well known to the FBI. Five years ago he was convicted for lying to federal agents about his plans to travel to Africa where investigators alleged he planned to join a terror group. The investigation into Simpson reached back to July 2007, when he was recorded saying of fighting with Islamists, "I know we can do it, man. But you got to find the right people that… Gotta have connects." Despite that and other recordings, a judge ruled the government did not adequately prove Simpson was going to join a terror group and Simpson was sentenced to three years' probation for lying to investigators. "We'd been tracking his online activities. He's been on our radar for a long time -- but there was no indication of any attack coming," a senior law enforcement official told ABC News. Kristina Sitton, who represented Simpson in the 2010 trial, said her former client had been on a no-fly list and that the FBI had attempted to get Simpson to cooperate with them, even after his conviction. She saw him, she said, as "harmless." "He grew up the most normal guy. Just a normal high school guy... Converting to Islam seemed like a good thing for him. He had been going down a bad path and then he found Islam," Sitton told ABC News. "He never struck me as someone who would do this sort of thing. I'm not a bleeding heart, I'm a Republican. I've seen some pretty bad guys and he seemed pretty normal." ABC News' James Gordon Meek, Lee Ferran, Alexander Hosenball and Cho Park contributed to this report. CLICK HERE to follow the Brian Ross Investigative Unit on Facebook.